A real treasure arrived in Friday’s mail. 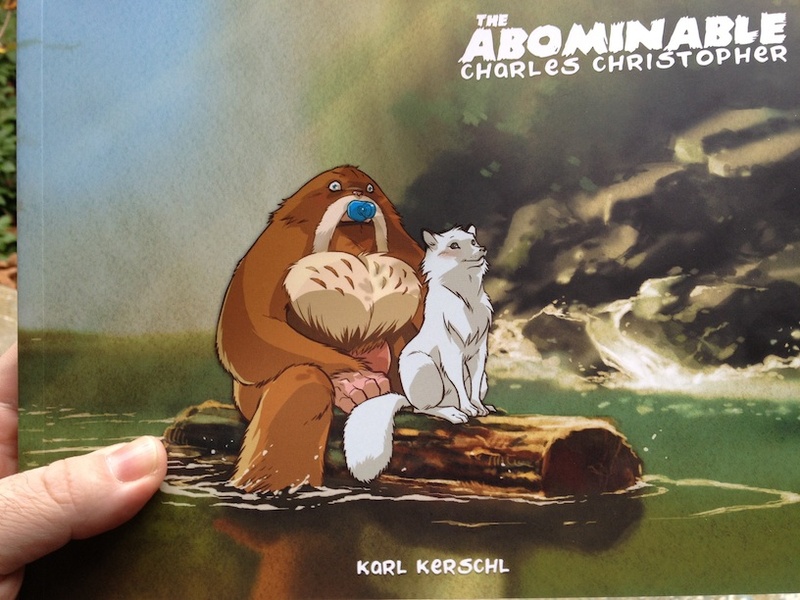 Observe, Volume 1 of the collected edition Karl Kerschl’s magnificent webcomic, “The Abominable Charles Christopher. It’s probably a good idea, as a general rule, to try to avoid declaring superlative absolutes, such as “this is the greatest webcomic.” But can I get away with saying “When I think ‘greatest webcomic’ this is the strip that pops into my head before I remind myself about the problem with superlative absolutes?” All right, then. There are three things I want from any ongoing webcomic series: terrific art, terrific storytelling, and a regular, reliable publication schedule. Normally I’m happy to get two out of three. “Abominable Charles Christopher” nails the trifecta. That’s the level of the artwork in this strip, week in and week out. I’ve never bought a print of any of his strips. Why? Because for God’s sake…which one would I choose? I’ve been a fan of “Abominable” for a year or two. When I stood in my kitchen and unwrapped the book, it was the very first time I’d seen Karl’s strip in printed form, as opposed to on a laptop or iPad screen. I must say, this book shows off the limitations of electronic publishing. Karl’s artwork leaps up to an even higher level. It’s obvious that Karl has in no way “dumbed down” his art to the limitations of a 128 pixel-per-inch laptop screen or a 1000-pixel-wide image area. Seeing these strips in print reminds me of just how much I’ve been missing. And mind you: I was already blown away by the art. “Abominable” in print is joy, doubled. I’m glad to have this book and I’m eager to recommend that you snag a copy for yourself. I’m also grateful for the chance to update the “Kind Of Truthful But Not Really” version of my cv. You have one of these, don’t you? It’s that second, slightly more-impressive cv that you’d never hand to a potential employer, and for an excellent reason: every item on it is technically true but wouldn’t survive a series of careful followup questions. For instance, my legit cv lists “Wrote an ebook about artificial habitats that was licensed by NASA as student educational material.” True. That happened. If the interviewer asks for details, I would happily and confidently tell them about the 60-page book I wrote about building aquariums and about the relationship between goldfish, gravel, water, air, and vegetation. I got an inquiry from NASA after I published it. After I signed and returned a bunch of forms, they gave it out (for a time) as part of a kit for schoolkids which explained the problems of building colonies in space. 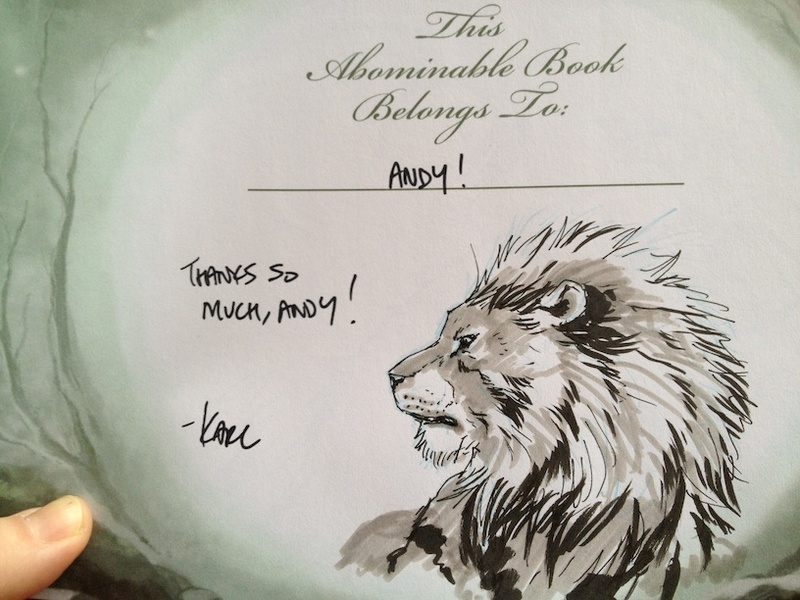 With that in mind, I point you to the back cover of the “Abominable” anthology. Karl knew that I’m a big fan of the strip and he asked me for a cover blurb. Before there’s any misunderstandings, dear reader, I quickly and emphatically reiterate that the Kind Of Truthful But Not Really cv is only a whimsical mental list and that I would never, ever, ever use it in a live-fire exercise, so to speak. Still! Although the statement “I collaborated with Jeff Lemire and Neil Gaiman on a book” has only the wispiest, slightest, most insignificant and monomolecular thread of truth to it, there are thousands of practitioners of homeopathic medicine who will be incredibly impressed. Or at least that’s how their belief system compels them to react. They only have two options: either tell people that I collaborated with Jeff Lemire and Neil Gaiman, or admit that the whole idea that the efficacy of something is magnified a thousandfold by diluting it down to near-undetectability is, in fact, all a giant scam. I like my chances. 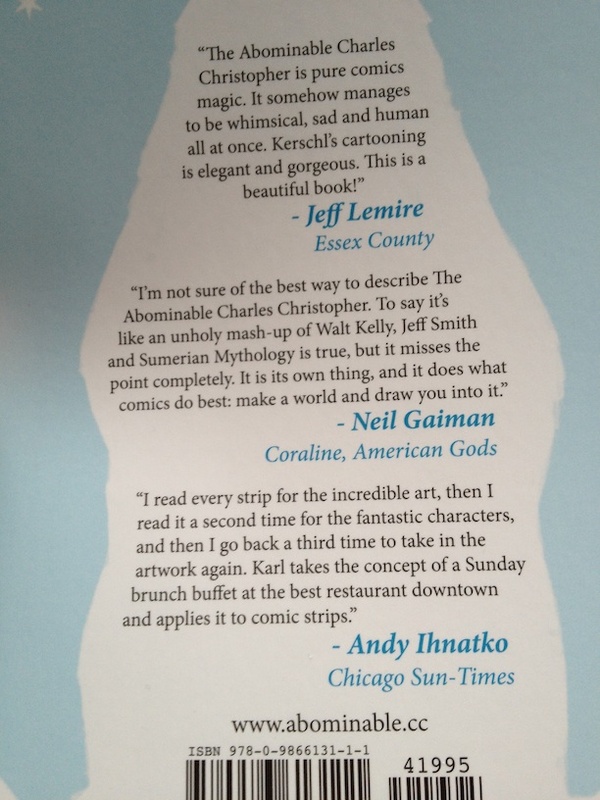 And if either Mr. Lemire or Mr. Gaiman is reading this, I just want to take the opportunity to say that it was a pleasure working…er…adjacent to you.